21st century is the age of collaborative technologies. Internet of things (IoT) has advanced from static information distribution to massive interaction among users. And social media within this sphere has emerged as a dominant tool for creating significant impact on how collaborative relationships can be formalized in society through information dissemination. While the general public is making massive use of social media properties for this purpose, however, there is little information available as to how such trends are impacting scholarly practices in the academic world. Today, social media has revolutionized the way scholarly work can be produced and further shared. And there are specific tools for building repository of content on various thematic areas. Blog among them is the most freely available platform which can be easily integrated within the institutional culture to archive intellectual output. With the evolution of web 2.0 (the social web), user generated content has become an integral part of the web space. Blogging is an act of writing that involves interactive features to start a two-way communication. Readers benefit from a host of features that allow them to leave comments on blog posts or share them on other social media properties such as Facebook, LinkedIn, Twitter etc. or can additionally email the content. 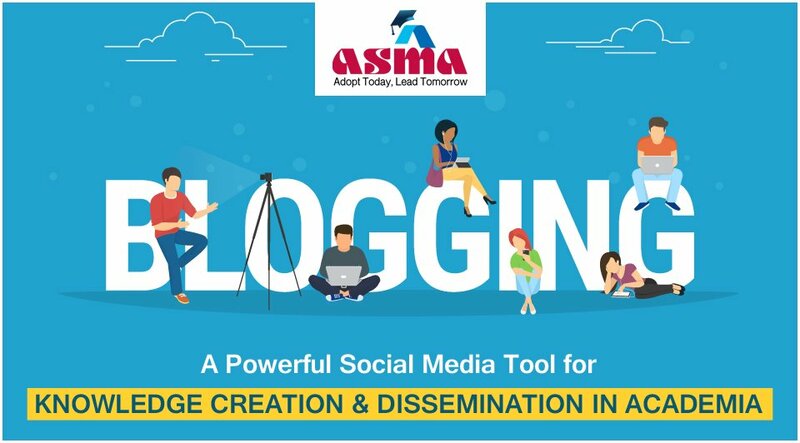 As Internet has become a major hub for seeking valuable information, academicians worldwide are realizing the importance of blogging. Blogs are therefore gaining popularity. As per the sources on the internet, “today, there are over 100 million blogs with more entering the blogosphere every day”. Blogs have become miniaturized version of e-books and lengthy research papers. In fact, blogging has become an important part of the online culture with some of the most popular bloggers continuously hooked to the platform. Their words are impacting traditional belief systems and creating new ideas for human progress and development. There are a lot of websites that will help you traverse the blogosphere from starting a blog to marketing and monetizing it. For engagement with admission aspirants and current students: Young generation is always connected through social media these days and advancement in Internet technology has made it possible. They are using social media tools for social engagement and information collection. As educators, how can we take advantage of this trend? To begin with, identify a fleet of writers for producing engaging content. Next, create a few topics that will generate user interest. Finally, encourage faculty and staff to contribute regularly on the official blog. Valuable resource for teaching and learning: Social networking groups in academia are using blogs to enhance teaching and learning. A lot of out of the class learning in contemporary education is happening online. Universities and Colleges can make blogging a mainstream communication tool for enhancing knowledge of its students. Since it is a platform for interacting, it can become a forum to carry forward classroom discussions, comment on contemporary topics or generate new ideas through collective effervescence. Faculty and Institutional branding: Faculty can use blogs to leverage their intellectual output. Through valuable support of faculty members, educational institutions can create a niche for themselves in digital space. The objective of involving faculty and staff is to build collaborative relationship and generate engaging content through sharing teaching experiences, philosophies, ideas and practices with students, colleagues, industry and other stakeholders. This will further help in improving brand visibility on search engines and educational portals. Once the authors are identified they can be asked to contribute weekly one article/blog (500-800 words) on a topic related to their subject or industry in order to support social media efforts of the institution for increasing online engagement and brand presence. Prepare a proper schedule with timeline to publish. Such blogs can then be published on the official blog page from time to time. As a result of blogging, a rich repository of valuable case studies and research work can be built over a period of time.